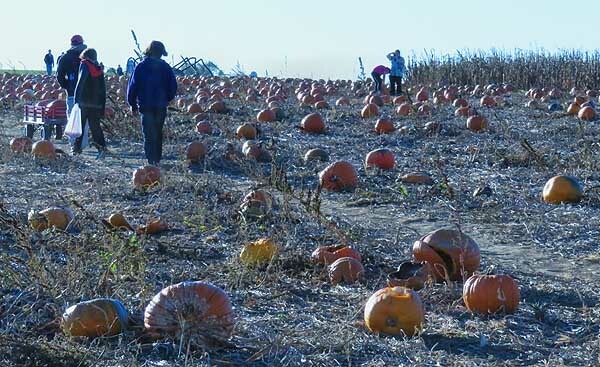 Halloween is over, what do farms do with all the pumpkins that are left? One thing to do is have a pumpkin festival! That’s what Cherry Valley Farm in Pennsylvania do every year. You get to throw them, smash them with sledge hammers toss them at nail covered boards to get them to stick and most popular of all, you can get the farm team to drop them from their cherry picker high in the air. Pumpkins thrown at nail board, see if you can make it stick. Its fun for the whole family, kids especially love it although smashing pumpkins with plastic sledge hammers (for kids) its not an easy challenge. We gave it a miss. Throwing them like shot puts or against nail boards is easier and very entertaining. Watching pumpkins go splat, though that is something everyone enjoys. 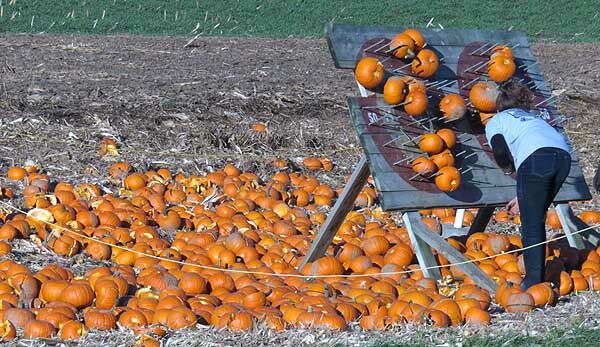 Pumpkin field, pick one and get the crew to splat it. The pumpkins get dropped onto a large concrete slab that the farm had put in specially. They have a field of pumpkins just behind this area and anyone can go find a pumpkin, bring it back, write a message on it if desired, then give it to the crew. They then core the pumpkins and fill them with water, so they make an even more impressive splat. Then they load up the cherry picker, raise it into the air and drop the things down to a great splat! It’s great entertainment. A few years ago they got an even better idea. Why not get those giant pumpkins that are grown for competition and drop those. 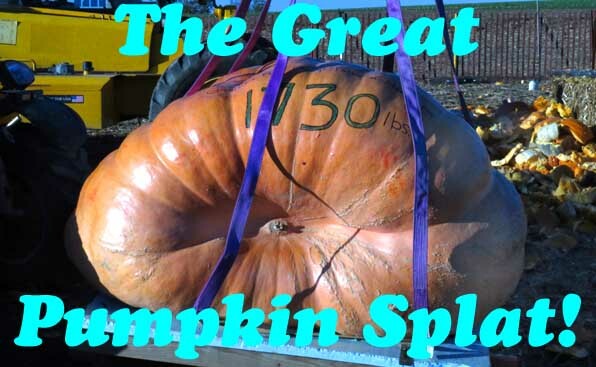 Lets face it there is not much you can do with a thousand pound pumpkin after its been entered into a competition so using it for a really entertaining splat is a wonderful idea. They usually have one or two of these giants. One is dropped in the middle of the festival and one as a finale. This year the first pumpkin was dropped onto a car the results were quite spectacular. This one I only got to see from the bridge in their corn maze as we were still working on the challenge of getting out of their excellent maze. We have been coming to Cherry valley for the maze for about 15 years now. The pumpkin festival is a lot younger than that. 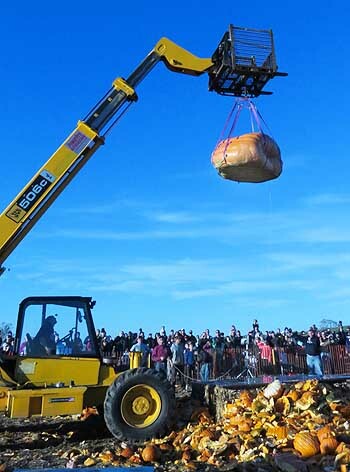 The giant pumpkin drop started about three years ago. 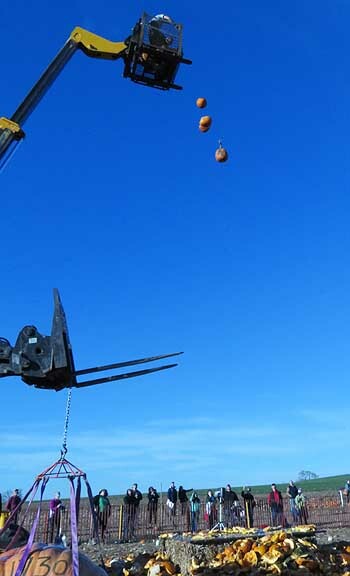 hoisting giant pumpkin up to get dropped. This year the finale stared ‘Orange Crush’ a 1730 pound fruit, which is a pretty huge pumpkin. This monster was moved around with a forklift and then raised up under their cherry picker. Once again its full of water for an extra special splat – plus the seeds were removed first by the grower ready for next years crop. This guy is dropped remotely using a cable, no one wants to be that close to this guy when it does down. The event drew a large crowd, just like every year. Somehow there is nothing like watching something go splat! Watch the giant pumpkin Orange Crush get splatted! Sorry the video is sideways I cant figure out how to turn it around. if anyone has the answer I would be delighted to hear it. Previous Previous post: The frost is coming! Next Next post: Its Early December. What’s still flowering?